"Al-Mutanabbi Street is the centuries-old center of bookselling in Baghdad, a winding street filled with bookstores and outdoor book stalls. Named after the famed 10th Century classical Arab poet, Al- Mutanabbi, this street has been, since time immemorial, the historic heart and soul of the Baghdad literary and intellectual community." On March 5, 2007 a bomb exploded on Al-Mutanabbi Street killing 30 and wounding 100. To mark the anniversary of the bombing and the essential role that art plays in our lives, poet Beau Beausoleil and others have organized readings in 10 cities. These readings are part of a much larger project that Beausoleil and a dedicated group of artists and volunteers have worked on since 2007. Read more at the Huntington Post. 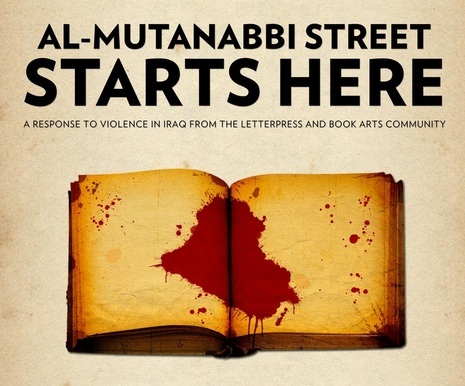 On July 2010, Beau Beausoleil put out a call for book artists to join ‘An Inventory Of Al-Mutanabbi Street’, a project to “re-assemble” some of the “inventory” of the reading material that was lost in the car bombing of al-Mutanabbi Street on 5th March 2007. We joined in with Beau that month, to co-curate the call to artists to join our project and further enhance the previous work of the Coalition by honouring al-Mutanabbi Street, through creating work that holds both “memory and future,” exactly what was lost that day. Beausoleil also reached out to artists to create books that would hold both "memory and future" of the bombing. There are 261 books that have been created as part of the project. More at the Huffington Post. More information at the Jaffe Center for Book Arts. At the Art of the Book exhibit you will see some of the book art created for Al-Mutanabbi by Rochester book artist, Scott McCarney. Read more below and click on the image for exhibit information. 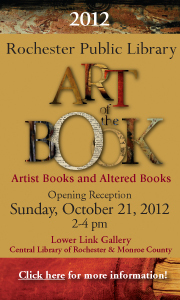 On October 21, 2012, the Central Library of Rochester and Monroe County will host the second exhibit of Art of the Book. Included in this exhibit will be a book by Rochester book artist, Scott McCarney in memory of those who lost their lives at Al-Mutanabbi Street. Entitled Material Meditation on Mending Al Mutanabbi Street, his book consists of fifteen two-sided loose-leaf prints made from collages constructed from remnants of found books, rubbings from book bindings and photographs. The leaves are gathered into a tar paper folder, like scattered pages picked up in the street and slipped into a convenient sheath. The fragments, assembled with staples, tapes, and glue, attempt to speak to reconstruction as well as memory; of life, literature and culture suspended, disjointed and reassembled into some sense of a whole. Sue Huggins Leopard is another book artist who's work will be seen commemorating Al-Mutanabbi. Her book is entitled, Elegies. Elegies uses part of a poem titled Elegy on the death of the mother of Saif al Daula, written by al-Mutanabbi in the year 948. Although written by the great poet in an age seemingly vanished and separated from the car bombing on al-Mutanabbi Street in Baghdad by more than a thousand years, the words remain very moving and speak powerfully to the universal themes of mourning and the futility of violence. I echoed these lines with words by an imagined poet in 2007. A poet who I imagined might be like a young person who would frequent a street of booksellers. A poet with a potential to see beauty; to speak. Book artist, Barbara Fox will also have her book shown. That Day On Al Mutanabbi Street 2012, is a collection of digital images and poetry on various papers. It is printed in English using Lithos Pro, and in Arabic the font is Baghdad. 4 inches high by 6 inches wide. Digital Images on Various Papers. You can see more her work on her website, Barbara Fox. twenty-eight shadow people in the pages, one for each killed. Their names appear on the back of each page. The last page has a reddish background to remind us of the more than a hundred wounded. Read and see more at the Centre for Fine Print Research. Find more information and images here at An Inventory of Al-Mutanabbi Street.